NEW VOTING INCENTIVE! 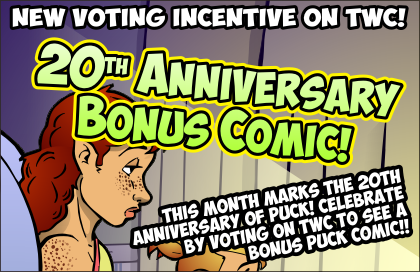 20th ANNIVERSARY BONUS COMIC! That’s right! Puck marks its 20th anniversary this September! Twenty years ago this comic began publishing in the McMaster Silhouette! Some of you weren’t even alive back then! To celebrate, I’ve put up a bonus comic strip this month which serves as a little homage to the very first Puck comic. Vote for Puck on TWC to check it out! VOTE FOR PUCK TO SAY, “TWENTY YEARS? HOLY S#$%, YOU’RE OLD!!! I don’t know about you, but I personally think that this a good idea. Well, who called daddy dearest? Well, I kind of thought of Tyler (nee Taylor) first. Then I remembered that he’s half the reason for this arc. Yeah, he’s at prom too. I think this comic arch is similar to the plot of “The Apple Dumpling Gang.” Someone has to babysit a child or two … there’s a gold mine involved, and Don Knotts blows up the town the dynamite. Then everyone goes to the prom. Don Knotts makes everything better. Ehh, that movie wouldn’t have been the same without Tim Conway. Waiting for what, the punch line to that joke list I left? Missed opportunity on my part. Well, I’m glad someone’s happy. I mean, who doesn’t have an aversion to babies? They cause property damage, and have such large mandibles, and … wait. I’m thinking of termites. Just as well. We can’t have competent parents. If parents were competent, who’d mess up the next generation? Don’t worry about Satan babysitting Miranda and corrupting her. After all this time with Puck and Colin and Phoebe and Daphne, she can’t possibly be corrupted any further. It would crack me the heck up if Satan turns out to be the most dreaded of all monsters: The one that likes babies and dumps everyone else into the trash compactor once Free Will kicks in at the age of 21. That’s … probably pretty likely. Satan running for re-election, needs a picture of himself with a child who isn’t crying? What, an evil politician can’t just have a real soft spot for babies? of course he loves to babysit – what better way to start the corrupting of the youth then being alone+unsupervised with them for hours on end? i´m not sure why tracee is panicking, if anyone will get stuck with diaper duty its sigmund. maybe she fears that just being around a little kid will ruin her figure…..or worse, give her hubby *ideas* i´m sure there´s no form of birth control he couldn´t sabotage with his hellish powers! Yes, I do think Sigmund would get the worst of this. Puck really needs to join a mommy coffee group. Because clearly she has no friends. I model Puck’s social life on my own. Like me, Puck is a bit of a misanthropic loser with a bad temper, a pessimistic outlook and a nasty tongue. So like me, I assume that she basically has no friends beyond the few individuals who have been forced to coexist with her for decades and have basically acclimatized to her misery. The judges would also have accepted “acclimated”. Satan is a mayor and is going to babysit his daughter’s best friend’s daughter. …Is there even a word for what kind of relation that is? Honestly asking. I can see no reason why this babysitting won’t go terrible. I imagine he might want to adopt one of those vaguely Eastern European terms for grandfather. Something like ‘Bumpchka’ or ‘Prappi’. I’m **SO VERY SORRY**, but when I heard “Prappi”, I thought it sounded like the sort of noise that might come out of Miranda’s diaper! That might have been intentional. Except Puck and the Prince of Insufficient Light aren’t quite that close. You don’t have to be close. You just have to be desperate. I know that availiable cast members are limited, but seriously? I know he’s Phoebe’s dad, but Puck also beat him up once, and Tracee is… Tracee. Probably still better than Colin’s family (even if they were an option). When this world is mostly a flaming dumpster fire full of terrible horrible garbage people, the Prince of Darkness is sometimes not the worst choice for babysitter. My (nearly) human pet “Baldie” actually SET a Dumpster on fire once. Not intentionally – it was merely a side-effect of a woodworking project (long story). Fortunately there were no “HOMELESS PEOPLE” sleeping inside the Dumpster, as “HOMELESS PEOPLE” were not invented at the time. Satan, babysitting, what the hell could go wrong? I see what you did there. And I approve. Nothing, if he remembers the “red headed” pregnant crack whore who he sent a gift basket to. Maybe he’ll have to send another one. Satan will work his wiles to turn Miranda into a little prima donna, a preeminent thoroughly spoiled brat. Nobody else will ever babysit her again, even if Puck had loads of money to pay them. Oh what wickedness is on its way! Well, technically Miranda isn’t a baby. I’m fine with Satan babysitting, but Tiffany? Mind you, this could backfire- Miranda could be so sweet Tiffany decides she wants one of her own . . . or Satan does! Darn. Tracee, not Tiffany. Mind you, birds of a feather . . .
She could SO easily be a Tiffany. Yikes! Let’s not get all topical here! I prefer to keep the comments section void of meaningful commentary on real life affairs. Good choice. Less evil and less likely to corrupt her than Colin’s parents. Is Tracee using Phoebe’s pattern drafting app? Mind you, it is a most efficient use of material. Nothing is waisted. Oh come on! Where’s your sense of adventure? It freaked out and hid under the sofa at the notion of intentionally handing a little child over to Old Scratch. I am sure he’ll lie to Tracee next about what he meant! TRACEEE really needs to reconsider. Imagine how a normally complacent PHOEBE might react should she be presented with a new LITTLE SISTER ! And Phoebe’s sister is on her way! One must wonder if that would be the first time that has happened in this strip. I’d expect Tracee’s been spayed. Interesting. So, the devil’s already working on wearing down his cyborg wife’s resistance to letting him take another shot at siring the anti-christ? Maybe? I suppose it all hinges on whether her ovaries have been replaced with cyber-ovaries, which are far less prone to demonic reproduction. I still can’t get over the fact that Satan is always slightly shrouded in the shadows. Just makes me giggle every time. It makes me giggle too … because it’s way easier to draw. I think Tracee and Phoebe are competing with each other for the world’s trashiest women’s wear. I tell you, the competition is fierce! I’d like to think that Phoebe is stylish, with the clothing sometimes incidentally wandering into the trashy zone. Tracee, meanwhile, is trashy, with the clothing sometimes incidentally wandering into the stylish. Phoebe is SO the baby of the family.